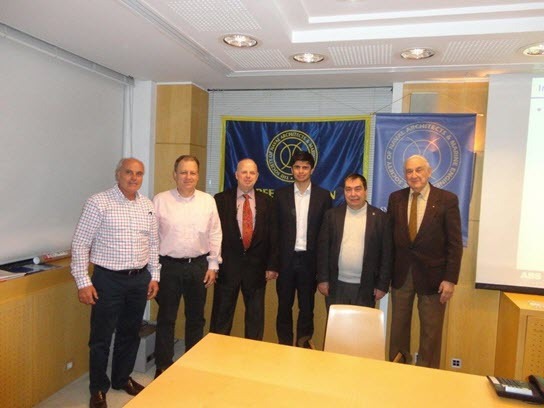 Technical Meeting Report on: Mr. Stamatis Fradelos, Principal Engineer at the Environmental Performance Department of the American Bureau of Shipping (ABS), Greece, speech on the subject of: ''A Holistic Approach to Energy Efficient Ship Design and Operation'', presented on 23 April, 2015. 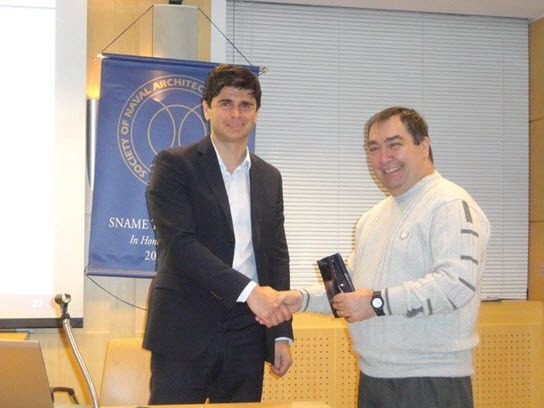 The Greek Section of SNAME held the April meeting at the MARAN Auditorium on April 23rd 2015. The speaker was a member of the ABS Global Environmental team Mr. Stamatis Fradelos, principal engineer. His speech was titled: “An Integrated Approach toward Energy Efficient Ship Design and Operation”. Although the date of the meeting coincided with St. George’s celebration day it was attended by 32 members and 1 non-member. The attendees were compensated by an excellent presentation on the hot potato topic of emissions and energy efficiency regulations. The central idea of the ABS approach is the lifetime, from cradle to grave, assessment of cost and a holistic view of the impact of a regulation, i.e. assessment in conjunction with related regulations. The design is based on a pre-defined operational profile and it aims to reduce hull resistance with employment of better engines, reduction of fuel consumption and potential addition of energy saving devices. The main criterion is the improvement of the operating performance through appropriate tuning of the design. Hydrodynamics is employed to improve propulsion efficiency and optimize the hull lines including the bow shape on the basis of the operational profile input. Improvements of the machinery element including ancillary systems are also part of the design considerations. These include the propulsion engine and generators, the economizers for the waste heat recovery, pump systems, ventilation and HVAC. The ultimate Key Performance Indicator is the fuel oil consumption which is monitored on a daily basis and reported to the assessment team. Any deviations from expected values need to be assessed and the causes must be mitigated. Fuel consumption is affected by environmental factors such as wind and waves, water depth as well as operational ones e.g. speed and trim settings of the autopilot and engine load. The operational performance of the vessel can be evaluated through the IMO-proposed EEOI index or another that possibly suits ship management in a better way. The environmental performance can be ameliorated with the use alternative fuels like for example LNG. Addition of Selective Catalytic Reduction (SCR) and Exhaust Gas Recirculation (EGR) will improve exhaust gas emissions regarding the NOx content whereas Exhaust Gas Cleaning System (EGCS)/Scrubbers will help reduce SOx. Another recommended option is fuel switching to low sulphur residuals and distillates oils. Last but not least the recycling phase must not yield hazardous residual materials which will create problems to the environment. The presentation was followed by many questions and lively discussion given that all of us deal with this tsunami of regulations and need to continuously assess the efficiency of the designs as well as monitor existing vessel performance. Last but not least we participated in the traditional reception and we all gave an appointment for the end of May when the international SOME 2015 Conference will take place with a very interesting and thought provoking program of papers. Some photos from the meeting can be found below (scroll down). Dr. Kokarakis, Section Chairman, presents the speaker, Mr. Fradelos, with a commemorative gift.